– The Clippers, as they have recently, once again showed a lot of resolve even though they were missing leading scorer Blake Griffin, who has missed the past three games with a partially torn quad tendon. The Clippers have won four in a row overall. – Another solid game by a the bench, which has not included the services of Josh Smith, who apparently remains in Doc Rivers’ doghouse; Smith has now not played in four of the past five games. Even Lance Stephenson played only two minutes in this one. Austin Rivers led the reserves with 22 points, Jamal Crawford scored 11, Cole Aldrich had seven points, three rebounds, two assists, two steals and two blocks; and Pablo Prigioni had five points – making both of his field-goal attempts – and four assists. – J.J. Redick scored a team-high 26 points and made 5 of 6 from 3-point range. Redick is now shooting a career-high 47.7 percent (73 of 153) from beyond the arc. Redick is third in the league behind Kawhi Leonard (48.8 percent) of San Antonio and Jared Dudley (48.3) of Washington. – Another solid effort from 38-year-old Paul Pierce, who started and played 21 minutes. He scored 13 points. He shot 4 of 9, 3 of 7 from 3-point range. He also grabbed five rebounds, doled out two assists, made a steal and had a block. – Speaking of 3-pointers, the Clippers shot 50 percent (15 of 30) from long-distance. After struggling in this area early on, the Clippers are now shooting 35.3 percent from 3-point range – tied with Portland for 13th in the league. A month ago, the Clippers’ percentage was 32.8. Delfino, 31, of Argentina, averaged 10.6 points, 3.0 rebounds and 2.0 assists in 2012-13 for the Houston Rockets. He signed with Milwaukee in that off-season but missed all of 2013-14 after having surgery on his right foot. An eight-year veteran, Delfino has a career scoring average of 8.1 points. He’s also averaged 3.6 rebounds and 1.7 assists. Raduljica, out of Serbia, is 7-foot-1. As a rookie last season he averaged 3.8 points and 2.3 rebounds. Dudley, a seven-year veteran, played just one season for the Clippers. He averaged 6.9 points, 2.2 rebounds and 1.4 assists and 23.4 minutes. 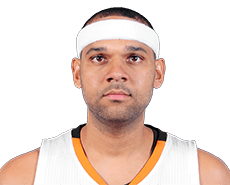 Jared Dudley has the ability to do some things on the basketball court. As recently as the 2011-12 season he averaged 12.9 points and 4.6 rebounds for the Phoenix Suns – both career-highs. But whereas he averaged 31.1 minutes that season, he averaged just 23.4 this past season for the Clippers, when he averaged 6.9 points and 2.2 rebounds. He did shoot a respectable 36 percent (81 of 225) from 3-point range, however, so he does have value. Dudley is signed for next season for $4,250,000, so the 6-foot-7 small forward will be back unless he is traded. Just 28 – he’ll be 29 in July – Dudley still has several years left to play. It will be interesting to see what his role is for the Clippers in 2014-15. The Clippers set a franchise record for victories in 2012-13 with 56. They broke that Tuesday with a 117-105 victory over visiting Denver. This weekend this group of Clippers – meaning the core consisting of Blake Griffin, Chris Paul and DeAndre Jordan – together will be heading to the playoffs for the third consecutive season, and reserve forward Jared Dudley is jazzed. “Last year they had a franchise record, and this year getting that, it shows you what this team is capable of now,” said Dudley, in his first season with the team. “Third time around going back to the playoffs, you bring in someone like (coach) Doc (Rivers) where expectations are higher, a lot of free agents coming in, and now it’s time to get started. – First and foremost, the Clippers clinched their second consecutive Pacific Division title with this 112-108 victory. Sure, they want much more, but this is still very cool. At 54-22, they are 34 games over .500 and have won 17 of their past 19 games and went 4-1 on this just-concluded road trip ahead of Thursday’s game against Dallas at Staples Center. – It’s good to see Jared Dudley contributing the way he is right now because strong benches are needed for long playoff runs. He scored 16 points while spelling an ailing Blake Griffin on Monday in a win at Minnesota. With Griffin back, Dudley played 24 minutes off the bench Wednesday and scored 12 points and made all six of his free throws, including the two that basically sealed the Suns’ fate. These back-to-back double-digit games are Dudley’s first since he scored 10 points Jan. 15 against Dallas. – Chris Paul is Mr. Clutch. His 30-plus foot 3-pointer as the shot clock was about to expire with 1:48 to play put the Clippers up 108-106, a lead they did not relinquish. Paul had 20 points and nine assists. He did not have a good shooting night – going 6-for-17 from the field – but he came through at the most important time. Like superstars do. Oh, he was 4-for-7 from 3-point range. Not too shabby at all. – As for Griffin, you could tell at times that his back was bothering him. Kudos to him for working through it. Sometimes that’s the best thing for a bad back. He played 34 minutes and after a slow start shooting, he ended up going 7 of 15 from the field and he made 9 of 10 free throws for 23 points. He had six rebounds – low for him – and three assists. – Finally, and most importantly, the Clippers once again showed they are a team that has that proverbial “Ninth-inning magic.” They were down by 17 points in the third quarter after having trailed by just two points (62-60) at halftime. They were on the road, playing against a Phoenix team fighting for its playoff life. And they come back and took the Suns’ heart right away from them. Victories like these are the kind of which championships are made.